On February 26, 2016, George was working as an electrician and mechanic laborer. While unloading a switchgear weighing 400 pounds on a truck bed, the rope holding it snapped, causing him to fall off the truck. George remembers falling backwards, hitting his head, and losing consciousness. When he woke up approximately 30 minutes later, there was no ambulance and his boss asked that he continue working, which he tried to do but the pain and swelling in his left hand and wrist was too much to bear. With no help by his employer, George went home and then took a taxi to Montefiore Hospital, where he was seen and evaluated by the emergency department physician. As a result of the accident, George suffered burnt trauma, contusions, left hand fracture, and head injury. He also had persistent pain in the neck radiating into the left shoulder/arm, lower back, and left knee. He received 2 epidural injections to his back, trigger point injections to his neck and back, and ultimately had surgery to his left knee. George could only sit or stand for 30 minutes at best and walking was limited. To this day, his jaw makes a clicking noise from the fall and he remains out of work. Thanks to his brother’s recommendation, George reached out to The Case Handler team for legal guidance! 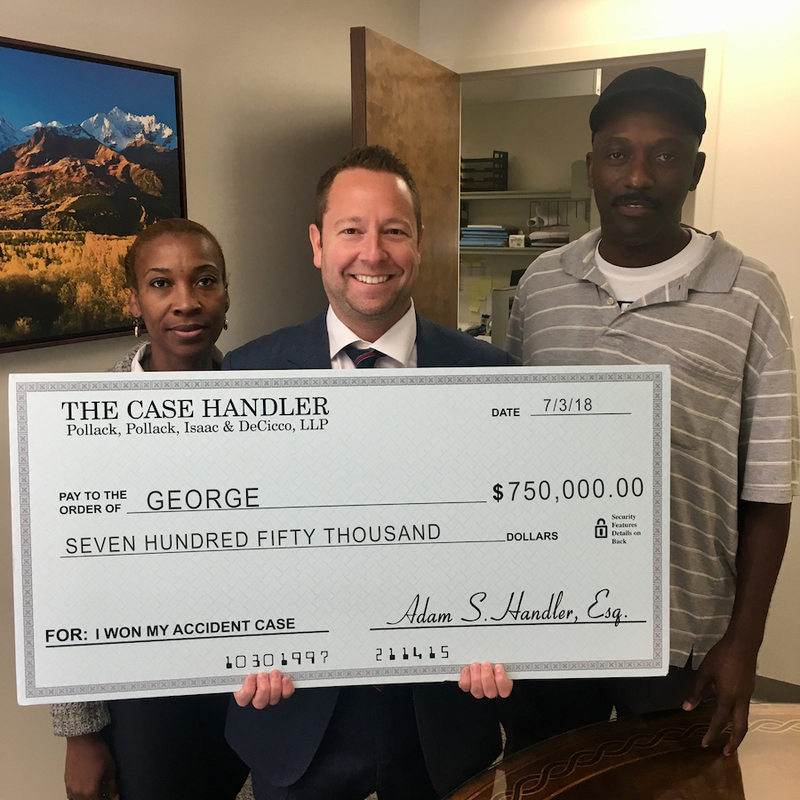 George needed a lot of medical attention for his injuries and with the help of our team, we made sure his medical bills were completely paid, his time out of work was paid and we successfully recovered $750,000.00 from the Defendant’s insurance company! At this point, we have seen it all – guilty individuals and insurance companies that will lie to your face to avoid paying anything, and negligent employers (like in George’s case) who fail to protect their employees and deny liability altogether. For anyone injured at work that may be going through a similar situation like George, don’t let fear prevent you from speaking to a lawyer. When insurance companies and employers fail to have your back, count on The Case Handler team at Pollack, Pollack, Isaac & DeCicco, LLP to protect your best legal interests at heart. If you or a loved one were injured at work, contact an experienced New York workplace accident lawyer that has a track record of success.